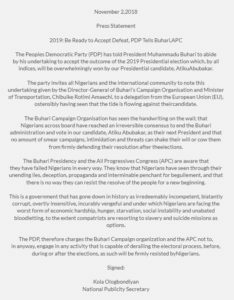 PDP (Peoples Democratic Party) in Nigeria has told President Muhammadu Buhari to abide by his undertaking to accept the outcome of 2019 Presidential election which, by all indices will be overwhelming won by the Presidential candidate of PDP Atiku Abubakar. 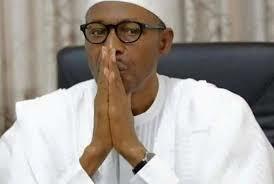 The statement claimed that Buhari campaign organization has seen the hand writing on the wall:that Nigerians across board have reached an irreversible census to end Buhari Administration and vote in Atiku Abubakar,as their next president and no amount of smear campaign, intimidation and threats can shake their will or cow them from firmly defending their resolution after the elections. The statement claimed that the Buhari administration and All Progressive Congress(APC) is aware they have failed Nigerians in every way. They know that Nigerians have seen through their unending lies, deception, propaganda and interminable penchant for beguilement and there is no way they can resolve of the people for a new beginning. The Statement added that the APC and President Buhari campaign organization should not engage in any activity that will derail the electoral process before, during and after the election as that will be resisted by Nigerians .